I've been on a hair defaulting kick, because I'm making a new 'hood and I want to be able to give all the sims EA hair, so the 'hood can be used without CC - but of course we can't give them ACTUAL EA hair, because it's fugly as heck. 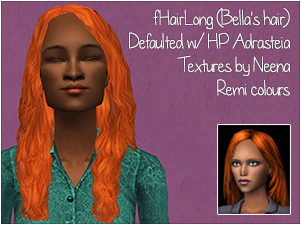 So here's one of my favourite CC hairs, HP's Adrasteia, as a replacement for fHairLong. I'm really glad I thought of doing this - there are loads of replacements for this hair out there, but they're all too smooth and slick, imo. The original hair is kind of wild and naturally untidy, and using Adrasteia means I can keep that effect! 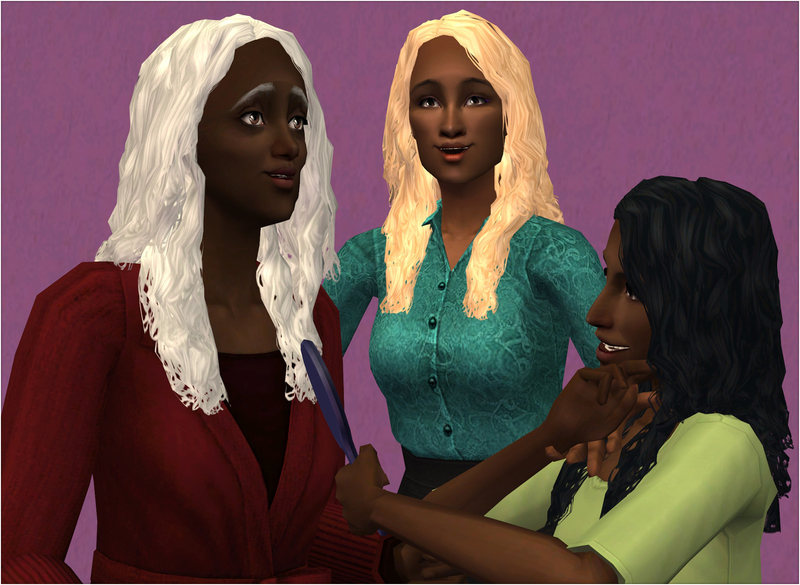 The hair is replaced for teens through elders; the original hair isn't available for kids or toddlers anyway. All the colours are replaced, including the three unnatural colours in the custom bin. 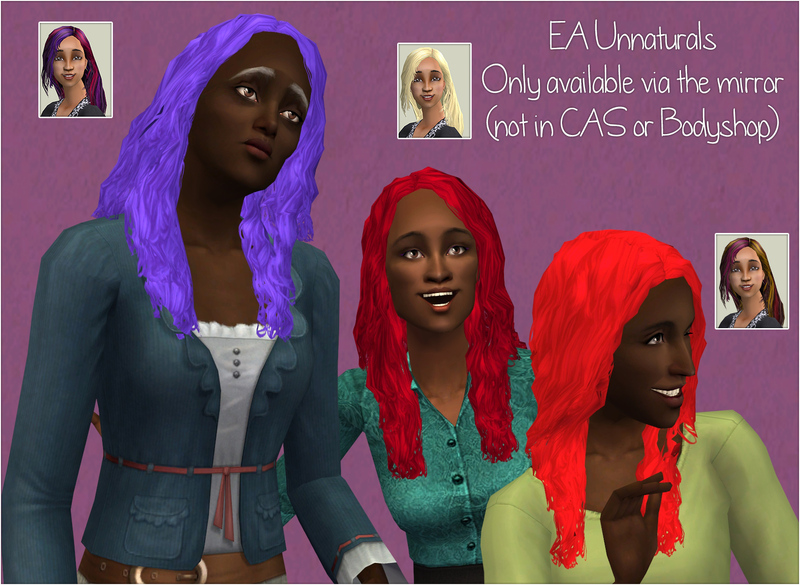 Because EA are unfathomable, unnatural recolours of non-CC hairs can't be found in either CAS or Bodyshop. The only place you can see them is if you tell your sim to change appearance in a mirror. The same is true of this default. The natural colours are found in the black/brown/red/blonde bins as usual. And now for some trivia: Bella was originally intended to be bottle blonde. Although she's shipped with black hair, the resources for the bottle blonde colour are called “bella”. Signs that she was trying to disguise herself, maybe...? 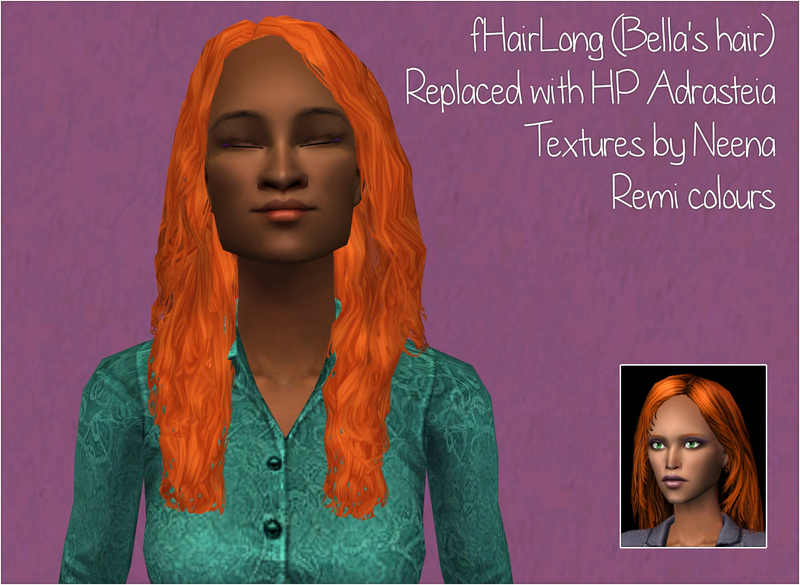 The textures are from Neena's retextures, recoloured by me using Remi's naturals and some Pooklet unnaturals. I made my own replacement packages for the unnatural colours because I couldn't find any existing ones; please feel free to use them as a base if you want to replace fHairLong with a different hair. Honestly, there are about six identical property sets for every dang age, it's not worth the hassle of doing it yourself. HystericalParoxysm for the lovely mesh; Neena Needles for the textures; and Remi and Pooklet for the colour actions.